In the bleak midwinter the kitchen can often feel like a Siberia of soups and stews. While there’s a certain wintry charm to sipping broth while perched on the radiator, it very soon becomes commonplace and, frankly, a little boring. Luckily, just as the doldrums become all too much to bear, mother nature takes pity, and gives us citrus. At once the kitchen is alive again with Seville oranges, Meyer lemons, ruby grapefruits, pink pomelos and, the subject of this very post, the elusive bergamot. A cross between a lemon and a bitter orange, bergamots are prized chiefly for their skin, from which oil is pressed to flavour soaps, scents and the much-loved earl grey tea. But finding a whole bergamot, flesh and all, is no mean feat. In fact, I’m almost ashamed to admit that prior to this year, I’d never actually eaten one, let alone cooked with one. So, you can imagine my excitement when, on a spontaneous trip to Natoora, I happened upon a whole pile of bergamots just begging to be whisked back to my kitchen. Upon returning home, the initial euphoria waned briefly when confronted with the dilemma of what to do with the darn things. Should they be shaken into a gin cocktail, folded into a cake, whipped into a curd or spooned into a tart shell and topped with meringue? Decisiveness has never been my strong-suit. I pondered the many possibilities for a good few hours, before eventually settling on a leaf out of David Lebovitzs’ book. I dusted off the preserving pan and boiled them into submission. Marmalade is always a good idea and the bitter-sweet bergamot lends itself perfectly to it. Cut each bergamot in half, remove the pips and then using a sharp knife, slice very thinly. Place the sliced bergamots in a large heavy based pot, cover with water and bring to the boil. Your kitchen wills smell heavenly. Let them boil for about 5 minutes, before draining. Return the blanched bergamots to the pan, add the sugar, followed by the water and salt and bring to the boil. I tend to use a sugar thermometer to gauge when its reached setting point at 103C, but if you don’t have one, you can do the classic wrinkle test, by dabbing a little marmalade on a plate that’s been in the freezer. If it wrinkles when nudged, then it’s done. Remove the marmalade from the heat, skim away any scum from the surface and stir in a knob of butter. 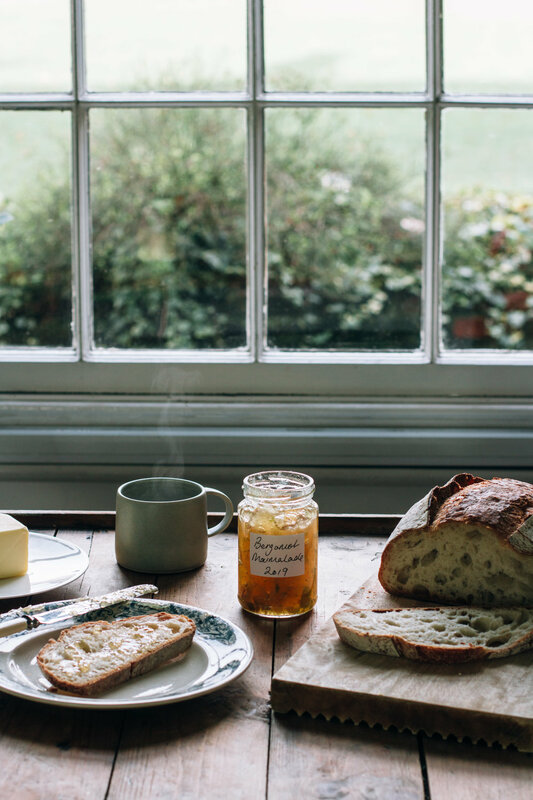 Ladle the marmalade into sterilised jars, top with waxed paper and then twist on the lid. Keep them in the fridge and eat within 6 months.